Comments about race relations shine national spotlight on Dr. Brian Williams ’91. Raw emotions quickly well up inside Dr. Brian H. Williams ’91 as he talks about the evening of July 7, 2016. The trauma surgeon was the physician in charge at Parkland Memorial Hospital in Dallas that night when dispatchers alerted medical personnel that several injured police officers were being transported from a Black Lives Matter protest nearby. “I immediately came down to the trauma hall and I arrived as the first officer was rolling in,” he recalls. Over the next six hours, Williams and his surgery team would try to save the lives of seven downed officers. Three of those treated at Parkland would not survive their gunshot wounds. Two other officers died at another Dallas hospital. As he chokes back tears, Williams recalls accompanying the bodies of the slain officers to the waiting medical examiner van at 3 a.m. the next morning. Many conflicting emotions were churning inside his heart and head at that moment. As an African American male, Williams is familiar with the fear and distrust that people of color can feel when interacting with law enforcement personnel. He also is well aware of the recent spate of officer-involved shootings that took the lives of black men throughout the nation. At the same time, Williams admits that violence against police officers goes against everything he learned as an Air Force Academy cadet and an Air Force officer. 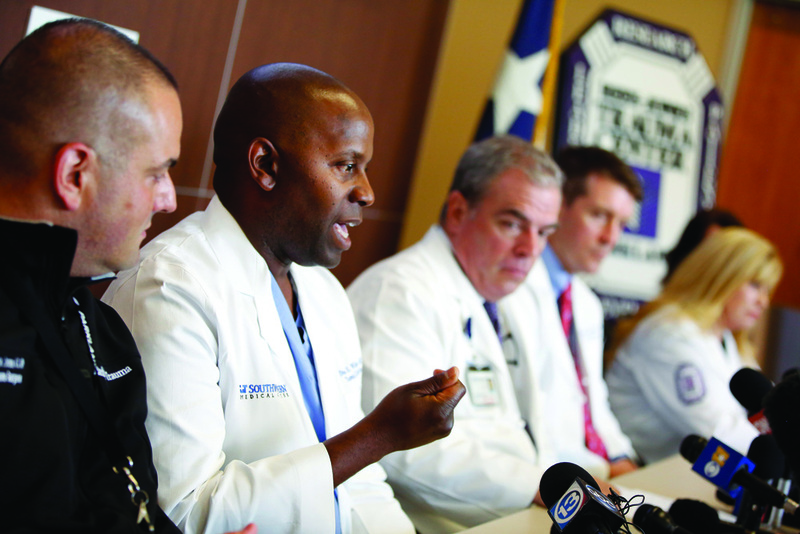 Four days after the Dallas tragedy, Williams would participate in a Parkland Memorial Hospital press conference to answer media questions related to the medical care provided police officers following the unprovoked attack. With the cameras rolling, Williams would instead open up about the frustration he feels as a black man and as an American who is fed up with the current state of race relations throughout the nation. The unscripted comments would propel him to national media prominence. Today, Williams is trying to make sense of his rise as unwitting spokesperson about escalating racial conflict and violence against law enforcement personnel. He credits his time as a USAFA cadet with providing him the tools to navigate the challenges that come with unexpected notoriety. And he’s counting on the core values he learned at the Academy to carry him through whatever the future holds. Growing up as a self-proclaimed “Air Force brat,” Williams says he always knew that he would attend a service academy when he grew up. He applied to all of the academies as high school graduation approached. As a Doolie, he would be a member of the Cadet Squadron 24 Phantoms. As an upperclassman, he was in Cadet Squadron Viking 9. He majored in aeronautical engineering, with the goal of becoming a pilot. After graduation, Williams headed to Williams Air Force Base for pilot training but did not finish the course. He would instead become a flight test engineer, and then later transitioned into special projects for the Air Force. We should all come together to find a better way to exist together. We’re all in this together. After six years on active duty, Williams decided to transition out of the Air Force and pursue a medical career. He attended medical school at University of South Florida College of Medicine in Tampa, Florida, and graduated in 2001. 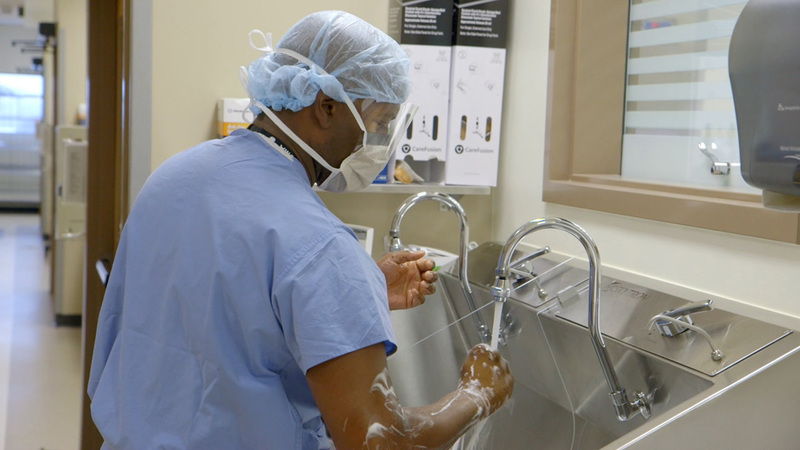 It was during his clinical rotation at medical school that Williams found his future calling — trauma surgery. In 2008, he completed his residency in general surgery at Brigham & Women's Hospital, a teaching hospital for Harvard Medical School. 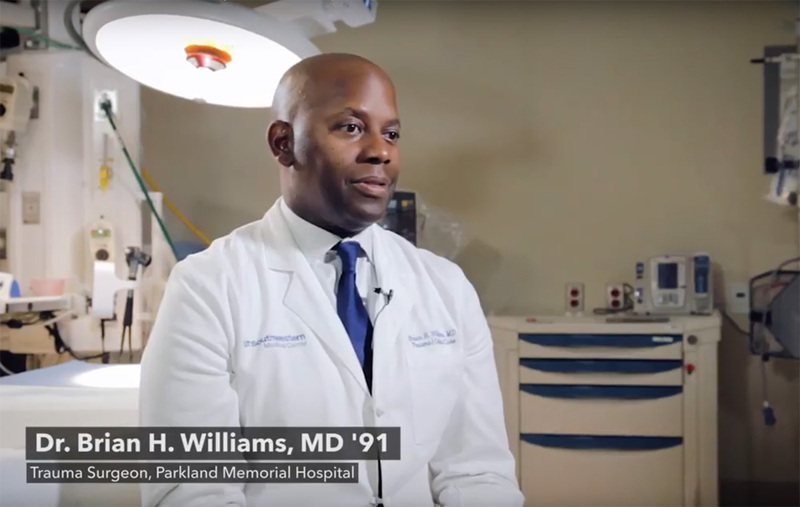 Williams then would accept a fellowship in trauma surgery and critical care medicine at Grady Memorial Hospital in Atlanta, a teaching hospital for Emory University School of Medicine. In 2010, Williams moved to Dallas to begin his current position. He’s an associate professor of surgery at University of Texas Southwestern Medical Center and a surgeon at Parkland Memorial Hospital doing trauma, critical care and emergency surgery. The bulk of Williams’ current position centers around teaching and mentoring medical students and residents. Five times each month, however, Williams also pulls 24-hour shifts inside Parkland’s trauma center. 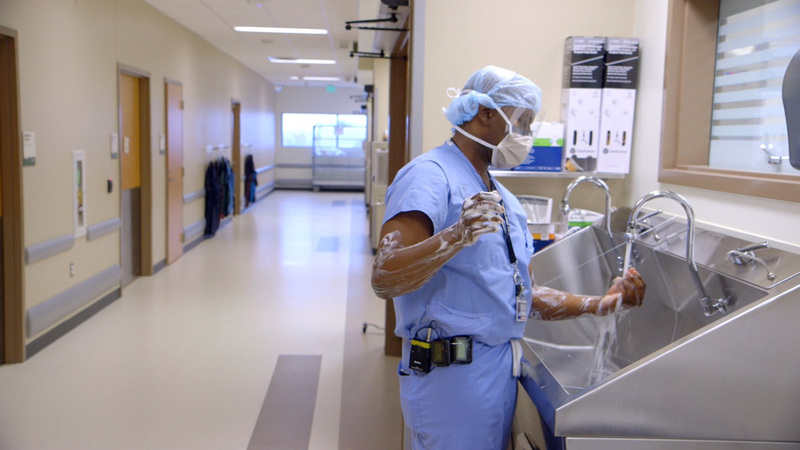 Williams says the variety of surgery cases he deals with during any given shift can be challenging and very rewarding, but heartbreaking, too. 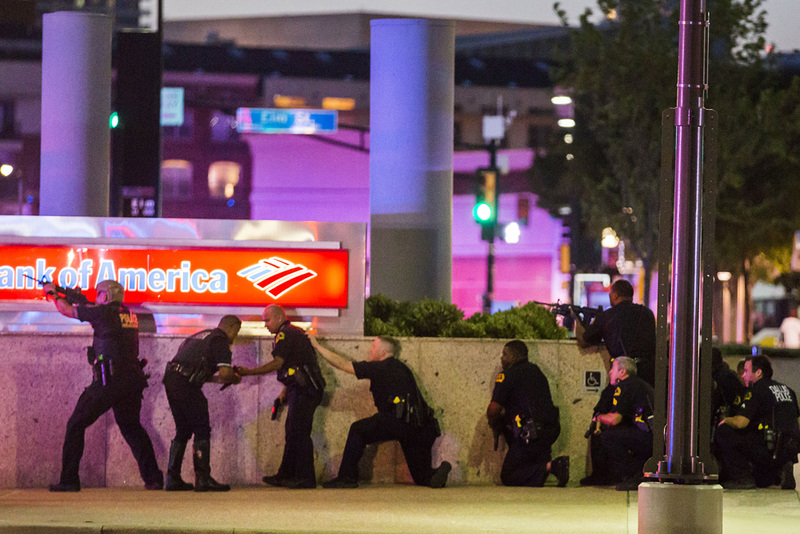 Williams wasn’t scheduled to be on duty the night of the Black Lives Matter protest in Dallas. But a surgeon in his group had a previous commitment and asked Williams to substitute for him. At around 9 p.m., word came that several officers had been shot and they were being transported to Parkland. Williams and his team had dealt with multiple gunshot victims before, but this tragedy carried particular weight because officers were gunned down while patrolling a peaceful protest. Despite the chaos of the moment, Williams said the entire trauma center team worked together to save lives. The team was unable to save three officers in their care. It’s a fact that haunts Williams even still. Williams knows he’s fortunate to be a black man in the 21st Century. He admits that he hasn’t had to deal with racism as much as his parents did, and his parents had it easier than his grandparents. Williams rattles off several examples of law enforcement encounters he’s experienced during his life that have helped build fear and distrust within him. As an Air Force officer, Williams recalls being pulled over for a traffic violation and “fearing for my physical safety” during the encounter. Five years ago, Williams was in his Dallas garage waiting for a ride to the airport when officers arrived to question him. Williams clarifies that he’s never been physically or verbally abused by law enforcement personnel, but he understands the fear and distrust that many people of color feel when confronted by authorities. All of those feelings flooded back when Williams heard about the officer-involved shooting deaths of Alton Sterling in Louisiana (July 5) and Philando Castile in Minnesota (July 6). Williams still was geographically separated from the growing racial tension much of the nation was experiencing, but that all changed July 7 when the societal rift led to the deaths of police officers in Dallas. Williams didn’t intend to say much at the July 11 press conference inside Parkland Memorial. But as hospital and law enforcement officials answered media questions, the trauma surgeon suddenly felt compelled to speak up about the inner struggle he’d been dealing with of late. Williams had voiced his frustrations about racial disharmony to friends and colleagues, but had never said anything to a larger audience. He talked about his previous experiences with law enforcement and indicated that many people of color are justified in their fear and distrust of authorities. “I fit that demographic, so I get it,” he told the media. He made sure to emphasize, however, that nothing justified the way police were recently being targeted by certain individuals and groups. “This killing … it has to stop,” he told the media. Immediately following his remarks, Williams found himself in the national media spotlight. He has been interviewed by CNN and numerous other media outlets, and he has appeared live on the Don Lemon show. He went to New York City a few days after the shootings to participate in a panel discussion called “Black, White and Blue: America 2016,” a discussion on law enforcement and race relations in America. Williams also was invited by President Barack Obama to a Washington, D.C. town hall event focused on race relations. Williams is pleased, nonetheless, that his comments have helped spark civil discussion about race throughout the U.S.
Williams has received hundreds of letters and emails since the Dallas tragedy. Most of the correspondence has been positive and supportive. Williams also has talked with several people in law enforcement since then, and a few have indicated that his comments changed how they conduct themselves as officers. As emotionally difficult as the tragedy was, Williams is convinced that he was meant to be on duty the night of the Dallas shootings. 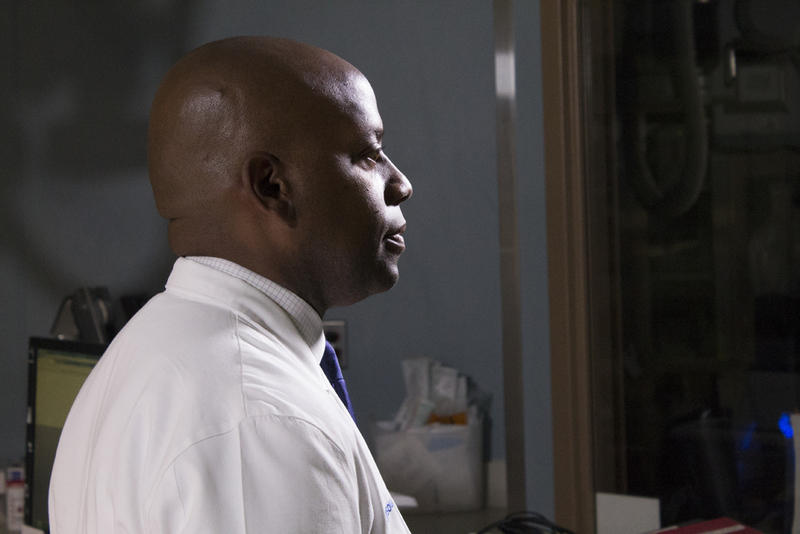 As the hospital’s only African American trauma surgeon, only he could have sparked the conversation that has ensued. Williams readily admits that he doesn’t hold the answers for solving our nation’s racial tensions. But he’s willing to remain a part of the conversations in the days ahead.